After chalking up his 300th win as coach of Whittier's Varsity Baseball Team on April 13th, Coach Joe Boland was named "Employee of the Month" during a staff assembly this week. 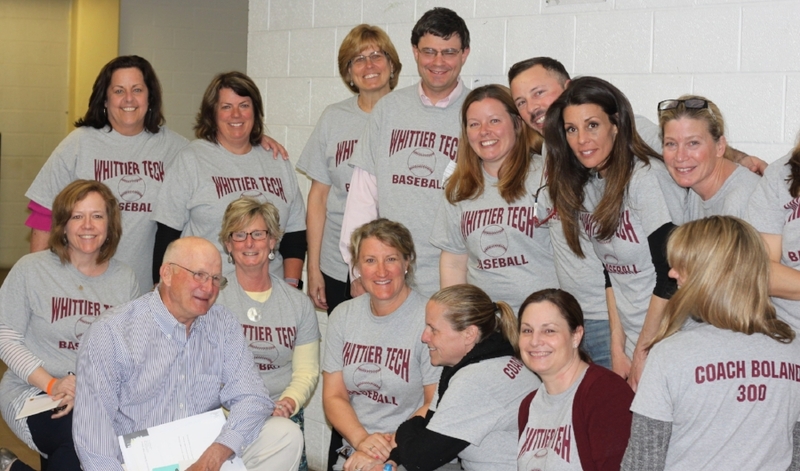 To help celebrate, staff wore Whittier baseball shirts with Coach Boland 300 emblazoned on the backs. "I didn't think it was a big deal," he told his colleagues. "You've really made this special." The team was also given t-shirts after the game, courtesy of a staff member. Mr. Boland will retire as a guidance counselor this year, but plans to continue coaching Wildcat Baseball.